I’ve not been as active on my blog as I’d like to be as of late. BUT I have a lot of exciting new posts coming up as well as a new YouTube video every Monday on my channel (which I would LOVE if you could come and watch my videos and subscribe (click here to to go to my channel). 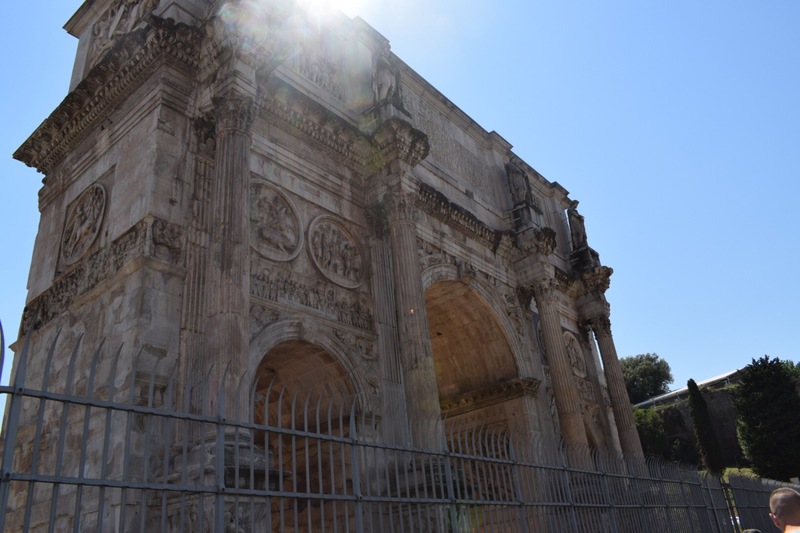 I have recently been on holiday to Rome which was A-M-A-Z-I-N-G! 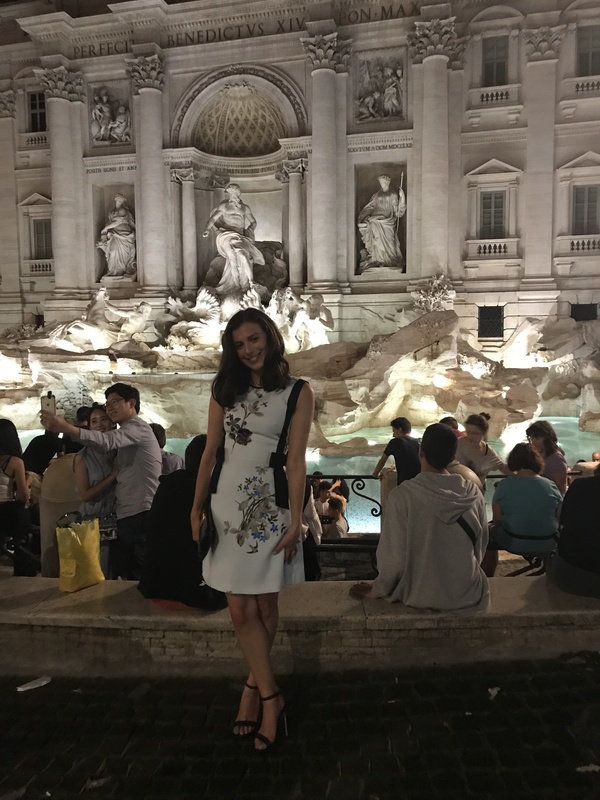 Being part Italian, I have spent many summers visiting Italy, but never Rome, so was super excited to explore the capital city of Italy. 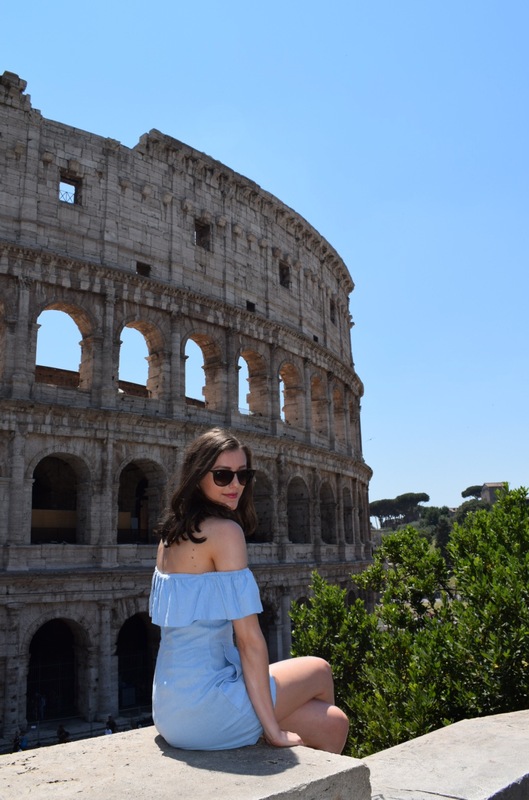 Below, I’ve included my recommendations on what to do, where to eat and where to stay as well as a few holiday snaps. Enjoy! 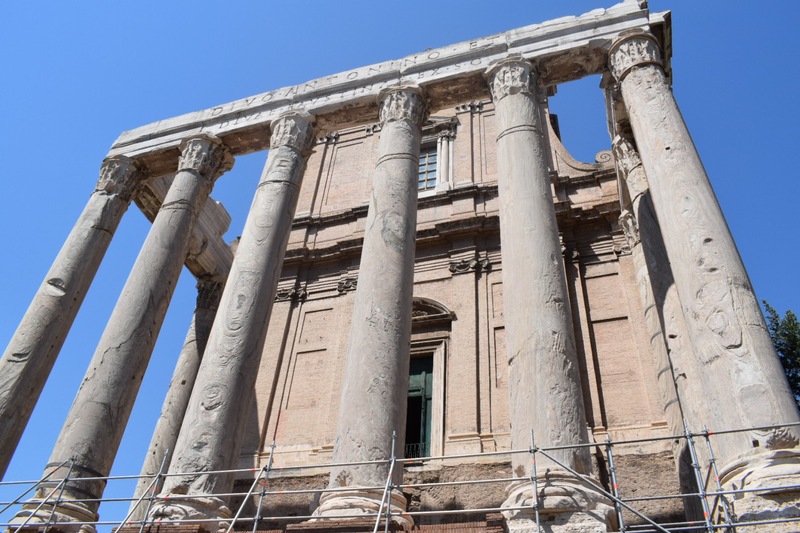 Rome is an incredibly old city, drenched in history. 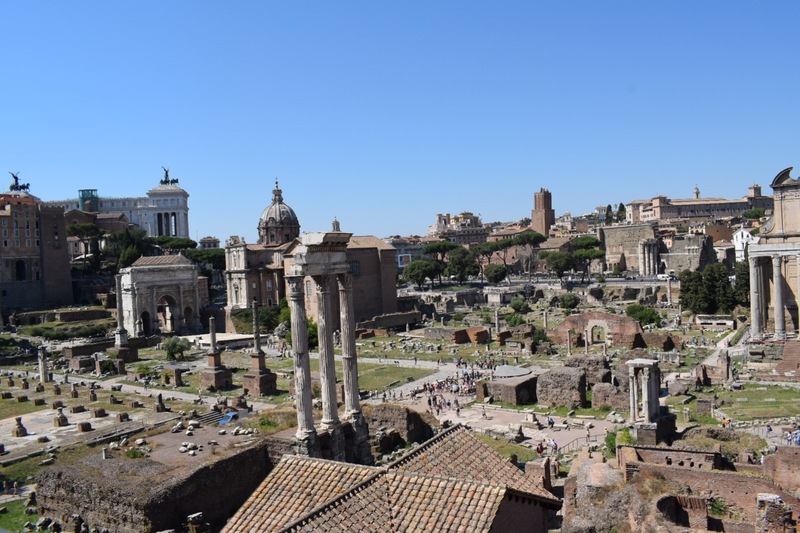 Being from London, I’m used to living in a city with history, but not the ANCIENT history Rome holds. 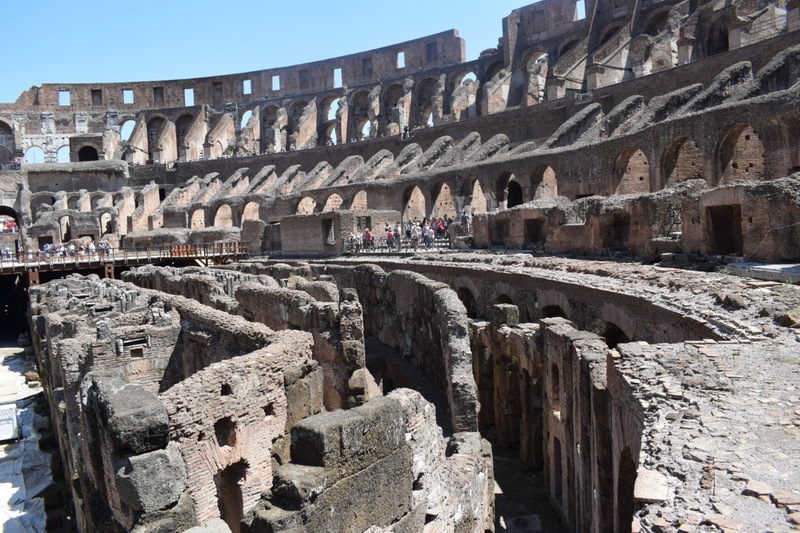 The Colosseum is an absolute MUST if you want to get a feel of Rome’s history. As you get near, you will get approached my 1,000 different people convincing you they have the best deal to avoid the “horrendous queue”. However, we only waited 15 minutes, if that, to purchase our tickets and then go straight inside! This may not be true on weekends and during summer holidays, so perhaps book online if you want to guarantee fast entry. 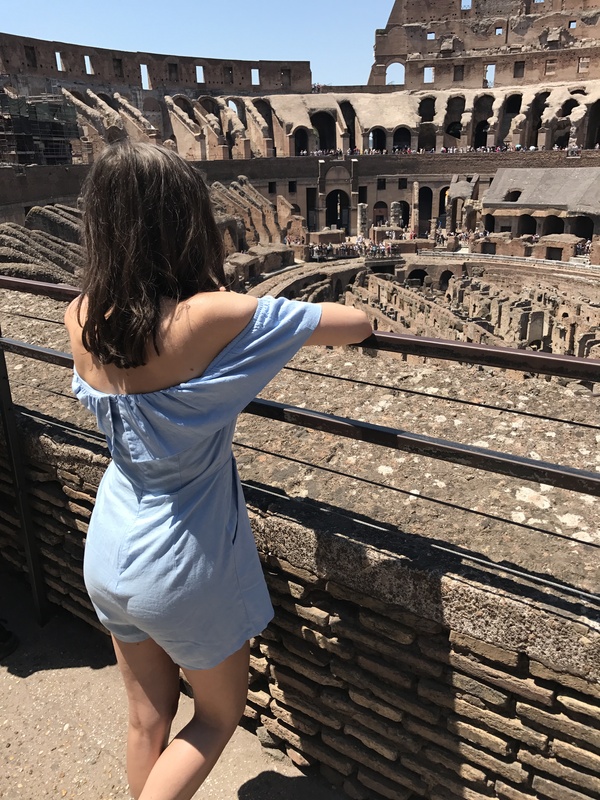 It cost us €12 each for our tickets which gave us entry to The Colosseum and the Roman Forum which I think is an INSANE bargain when you think of how much it costs to visit a London attraction. And this ticket gives you entry to two places not to mention one of the new wonders of the world. 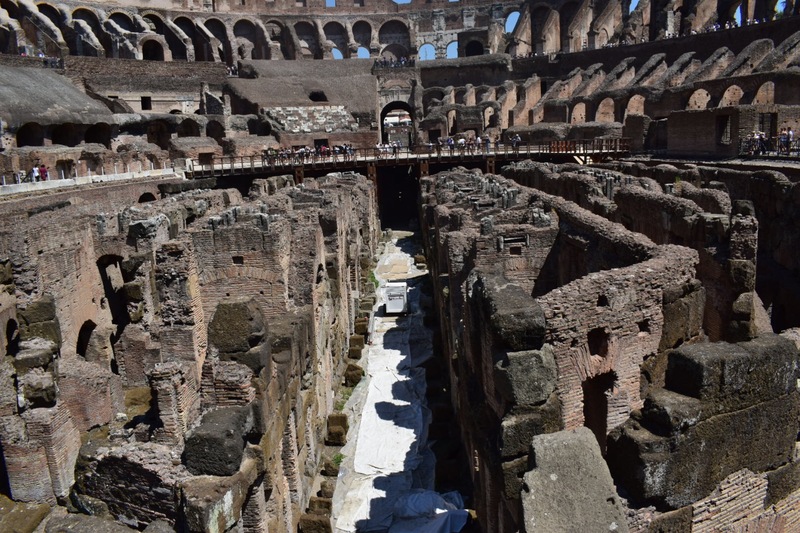 The Colosseum and Roman Forum blew me away. 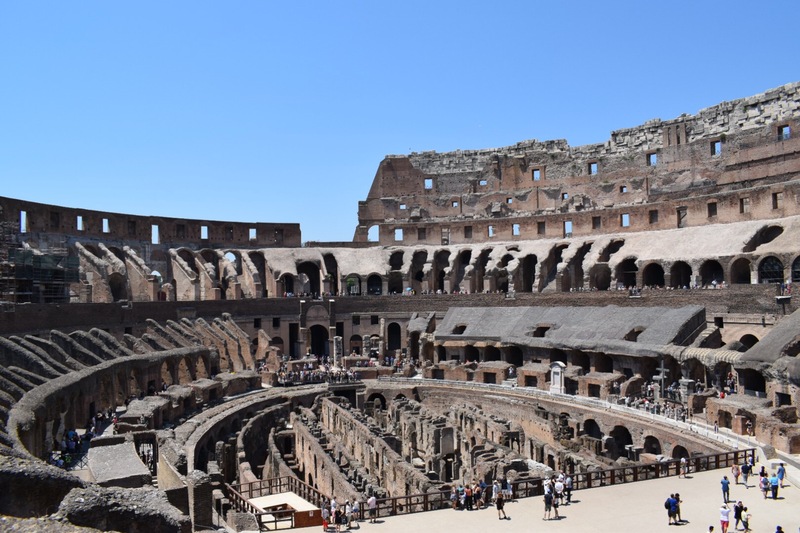 It is so incredible to think how much has happened in the world since they were built and how they are still standing (even if a little worn down). And not to mention how these HUGE buildings would have been built in those times without the resources we have today. Make sure you bring a bottle of water with you if you go in the summer as it can get really hot and there is little shade. There are lots of fountains where you can fill up your water for free as well as lots of bottles of iced water being sold for €1 so carrying change is super handy. 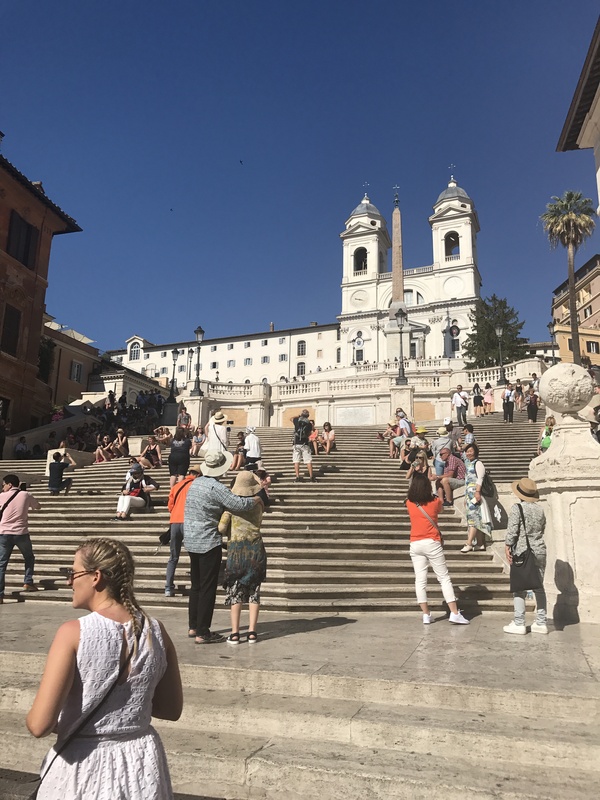 You can’t go to Rome without visiting the breathtaking Trevi Fountain and the famous Spanish Steps. 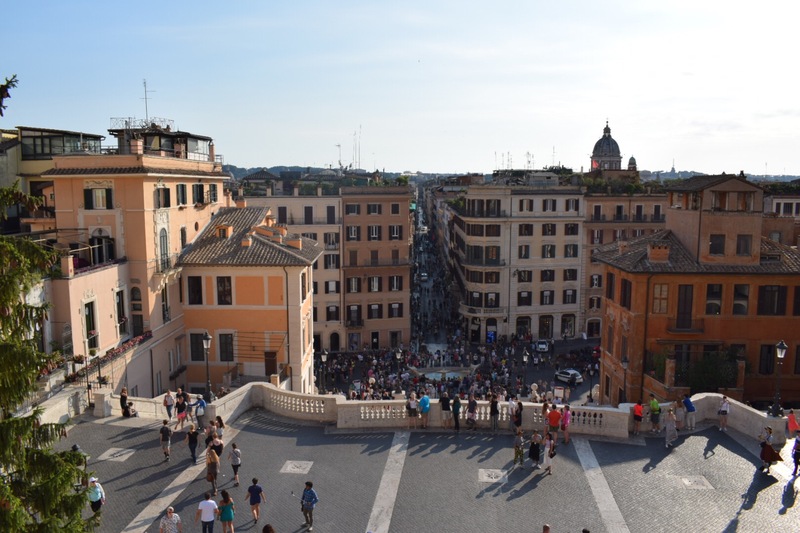 Be prepared to battle the huge crowds to get a closer look of the Trevi fountain, but it is definitely worth it. Photographs really don’t do this beautiful fountain justice. 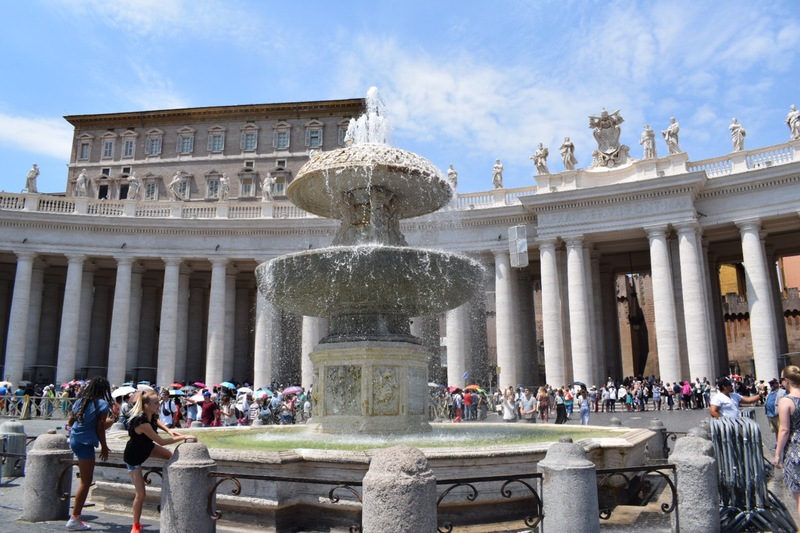 The sheer size of it was definitely a surprise to me, and the detail and beauty of the fountain took my breath away. It is also equally beautiful at night time and really romantic (we even saw a marriage proposal!). 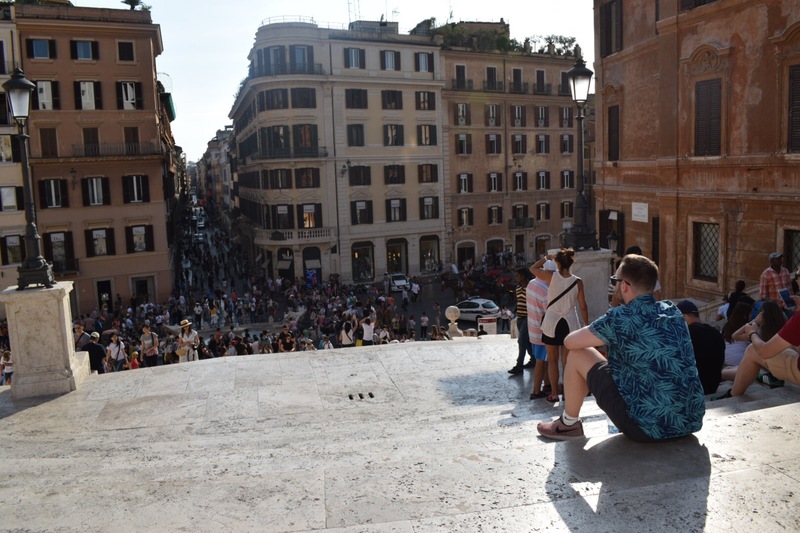 As you climb to the top of the Spanish Steps and look down at beautiful view and the big crowds, it feels oddly peaceful in this busy city, as you can enjoy a rare moment of calm amongst the hustle and bustle. 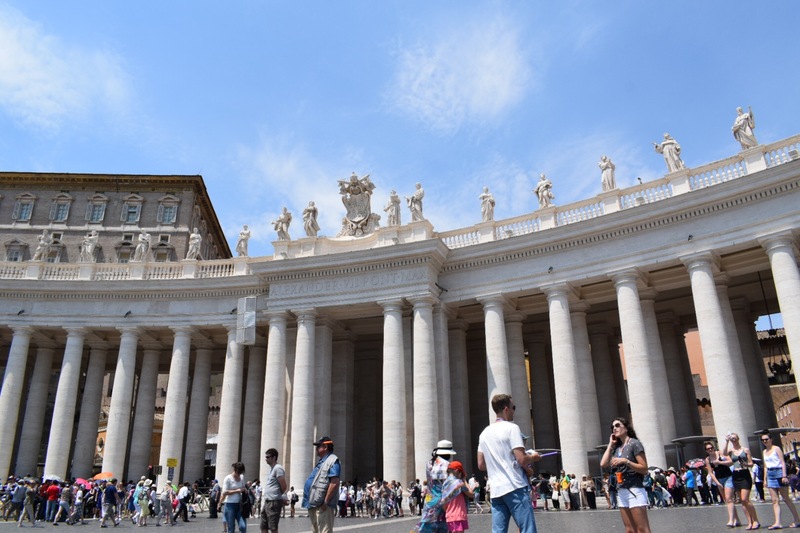 Vatican City is another popular tourist spot.. Again I was in awe at the huge size of the buildings and how stunning and detailed the architecture was. 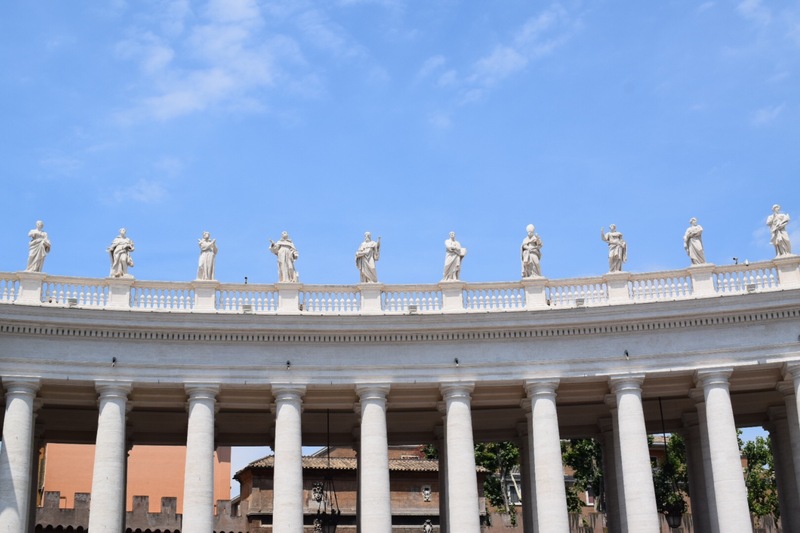 If you are someone who wants to visit the various museums, definitely book in advance or even splash out when you are there and get a private tour guide which will allow you to skip the CRAZY queues (I have honestly never seen anything like it!). 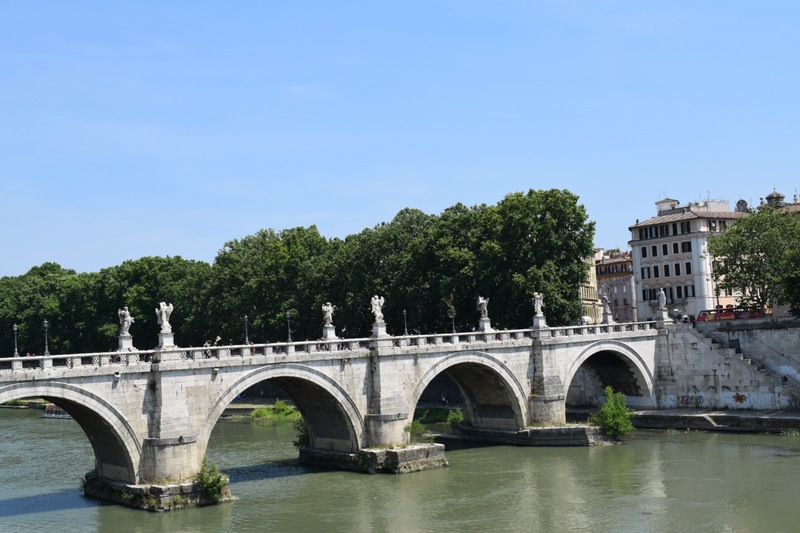 We enjoyed taking our time to take in the beautiful architecture and explored the area and walked over the beautiful bridge. 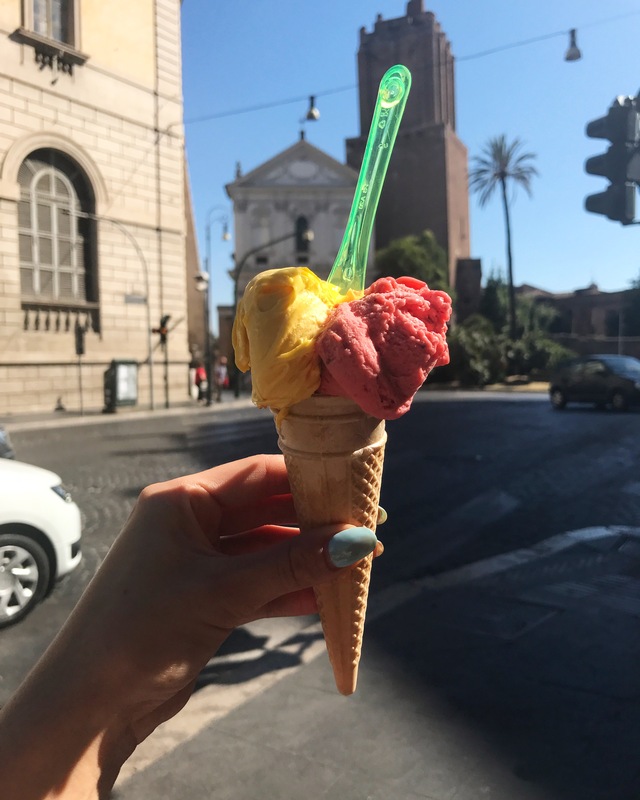 During the day, we opted for authentic pizzerias, bakeries and gelaterias. 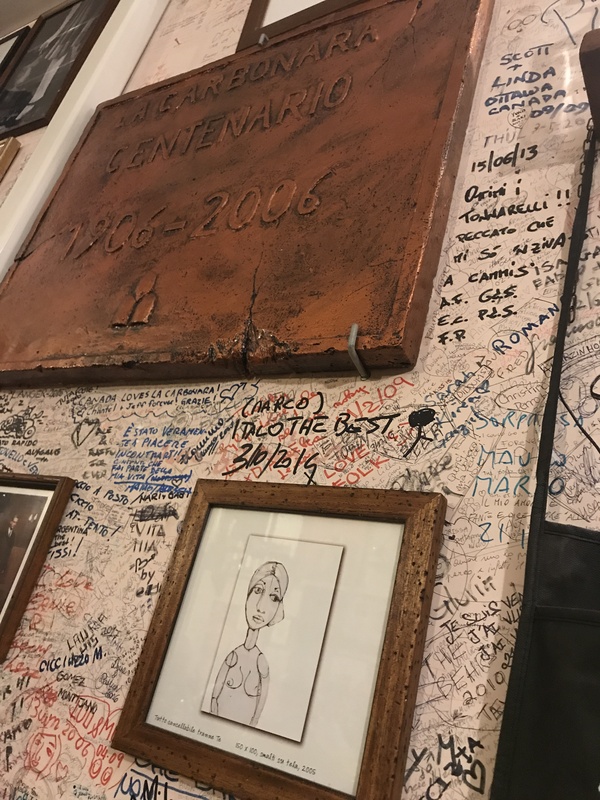 We ate the tastiest slices of classic margherita and pizza topped with thinly sliced potatoes (which I HIGHLY recommend) and mouth watering focaccia. My boyfriends absolute favourite Italian delicacy is arancini (stuffed rice balls, usually filled with mozzarella and peas and also often with meat) so several of these beauties were devoured. If you have a sweet tooth try an Italian pastry which are really light but super tasty. Avoid getting food to near to the tourist attractions as they will rip you off. 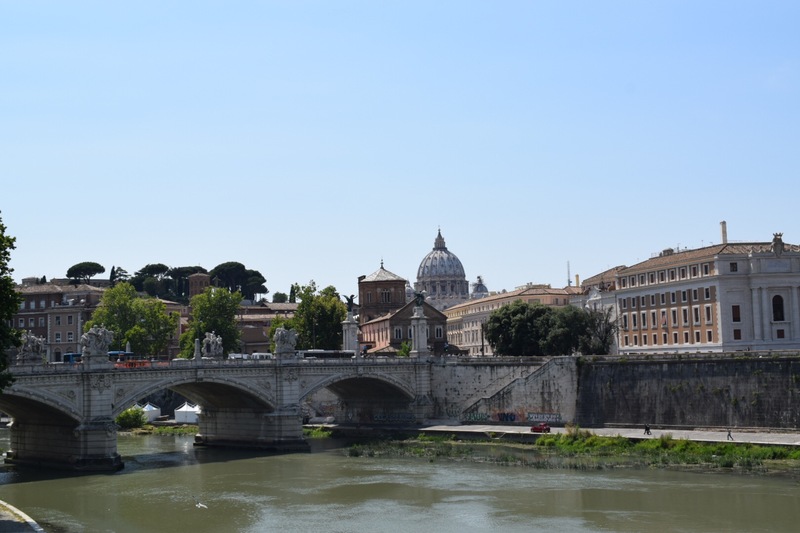 Head down side streets and take your time exploring to find some authentic Italian gems. On out first night we visited La Carbonara for dinner. It is very popular, so either book ahead or go really earlier or very late to avoid a long wait. 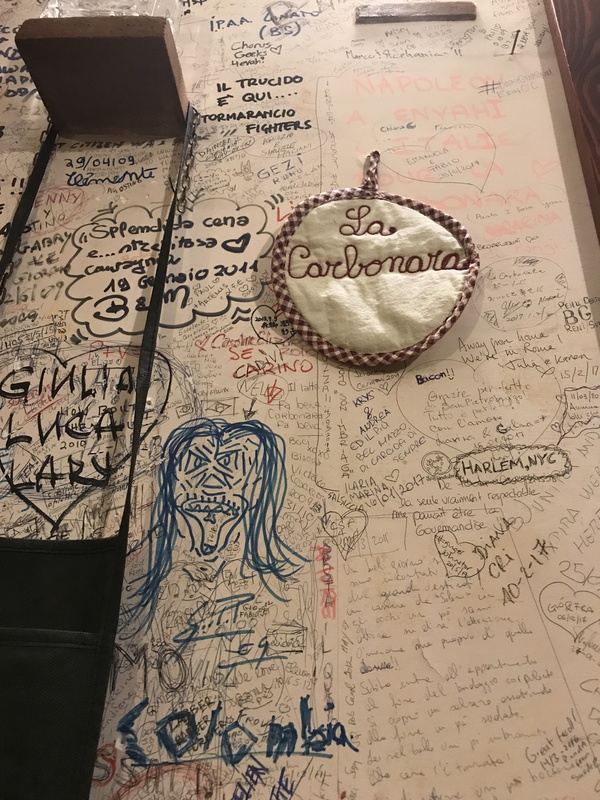 This quirky restaurant is covered in graffiti and customers can also add their own mark to the walls. 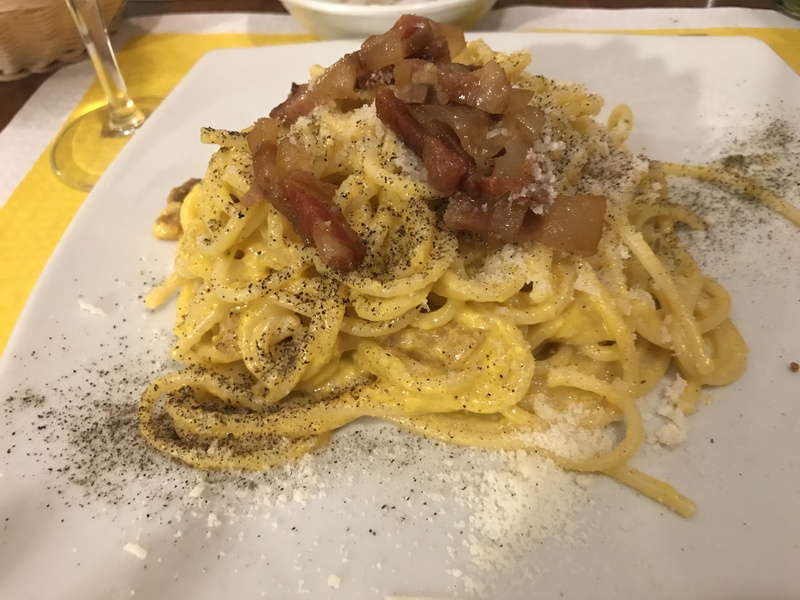 As the name suggests, the restaurant makes an incredible Rome classic, carbonara, which is a must to eat when in Rome as well as lots of other Italian classics. There is also great selection of beer and wine (which went down a treat with a bowl of pasta!). The prices are INSANELY cheap for both food and drink. 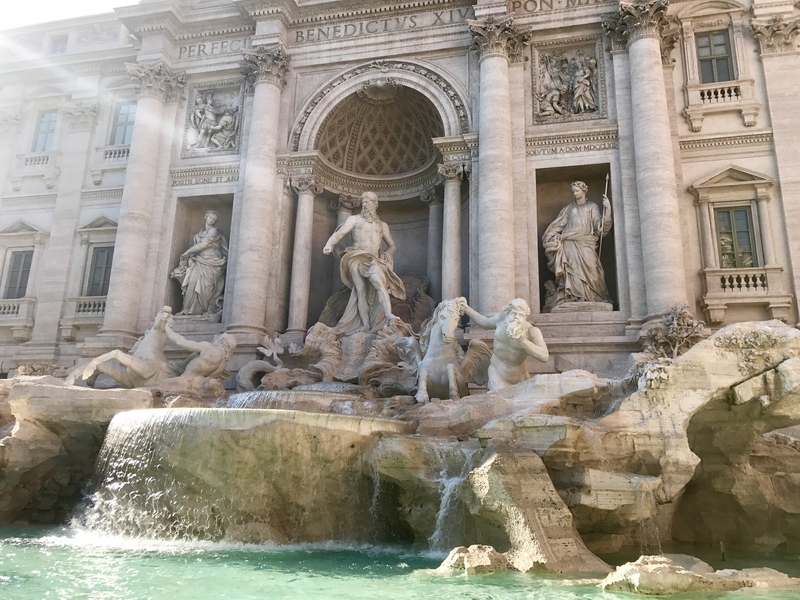 If you want to dine nearer to the Trevi Fountain, but want to avoid the pricey tourist traps visit That’s Amore. This homely restaurant has the friendliest staff and cute decor contrasted with black and white prints on the walls. D-e-l-i-c-i-o-u-s food (my boyfriend highly recommended the lasagne) and LETHAL cocktails and very generous helpings on limoncello. You’ve been warned! 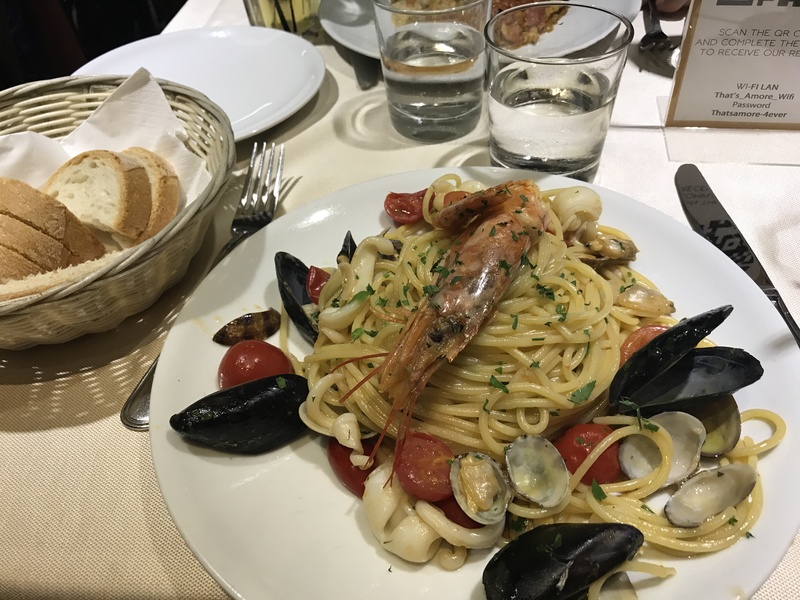 Due Colonne is a very authentic Italian restaurant tucked away about 10 minute walk from the Colosseum. 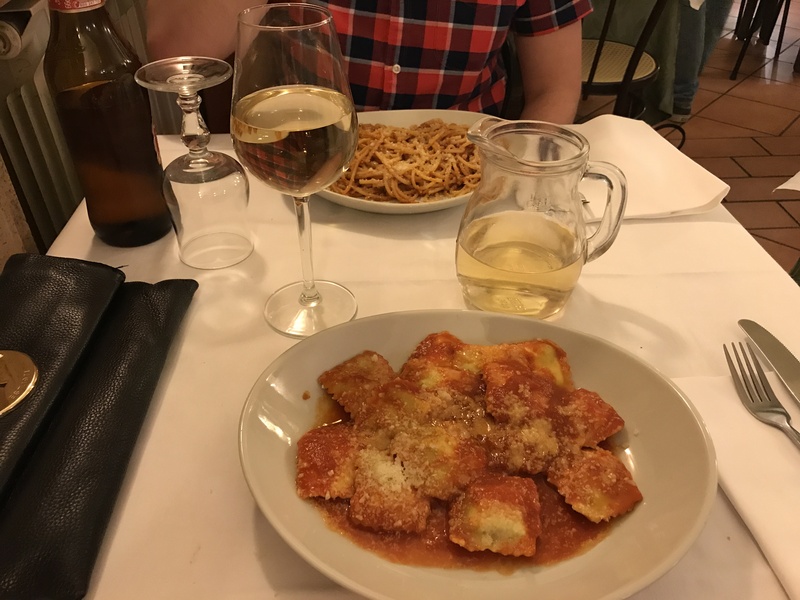 When we visited, there was huge Italian group dining there so we knew it was going to be good if the locals eat there! 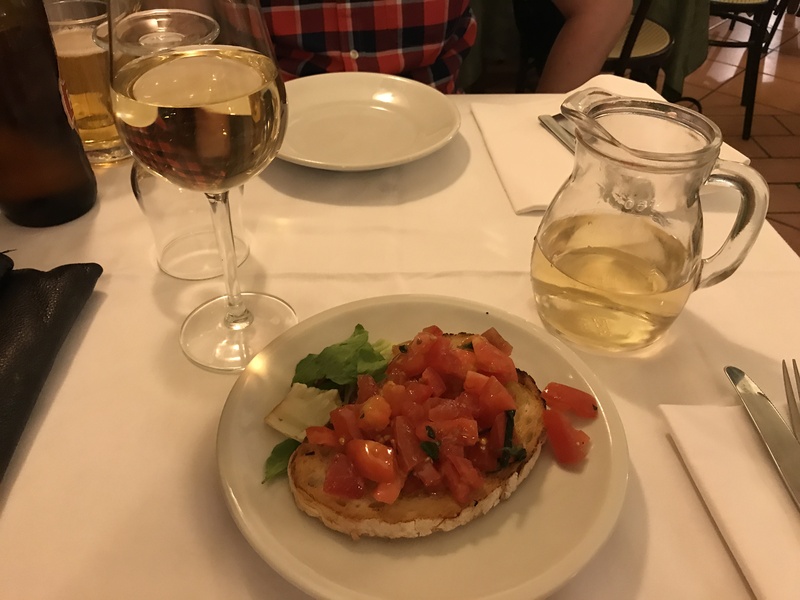 Bruschetta is another staple dish of Rome so I was eager to order it on the last night and it was worth the wait. The tomatoes were packed with flavour on top of the delicious bread. It was so tasty that Bradley (my boyfriend FYI) kept going back for more of my starter and he doesn’t even like tomatoes! The Ravioli was equally delicious. Simple but VERY flavoursome food. 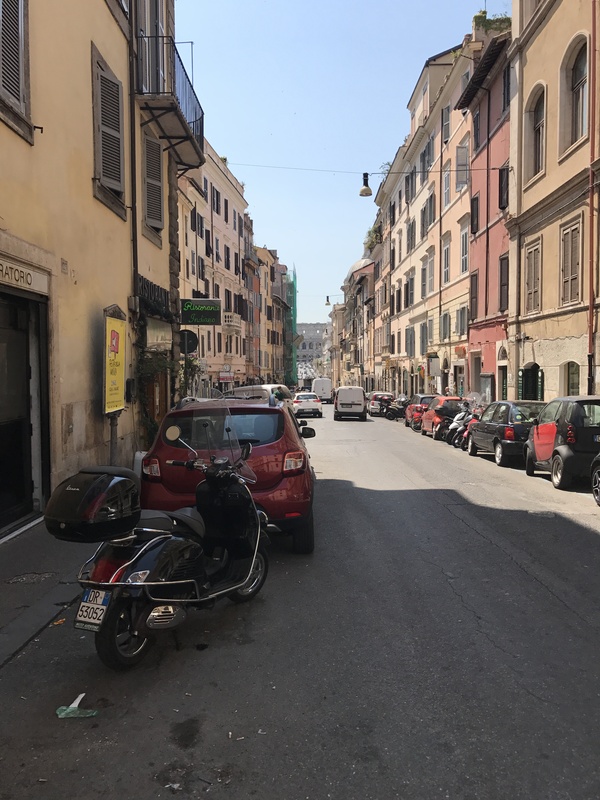 We stayed at the Rome Times Hotel which is part of the Mood Hotels group which have seven hotels across Rome and one in Venice. 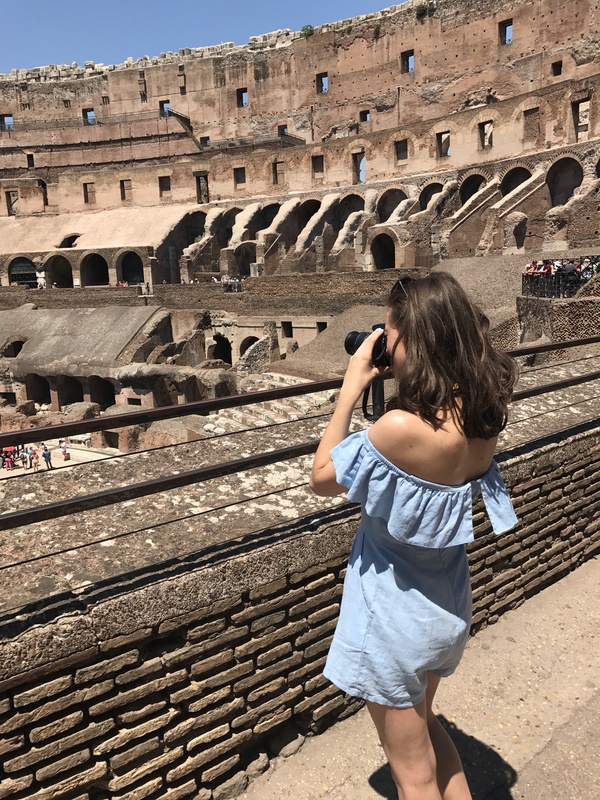 It had an amazing location which allowed us to walk almost everywhere, with the Colosseum 10 minutes away and the Trevi fountain about 15 minutes away. Lots of restaurants and bars were literally around the corner from the hotel too, so we were spoilt for choice each night. Our room had a nice modern design with a huge, very comfortable bed (a hotel must!) but the best bit about this hotel was the roof terrace. Other hotels in the Mood Hotels group have rooftop bars I believe, but I actually enjoyed the small terrace as it felt more personal. 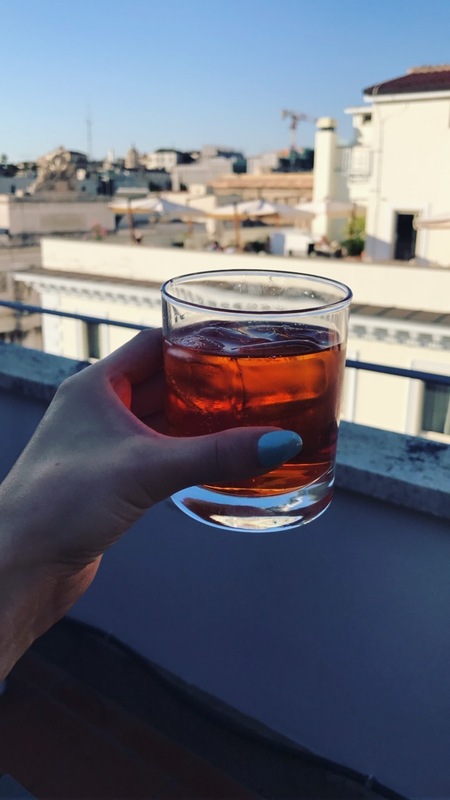 After a long day of walking around and exploring in the heat it was so peaceful to relax with with an Aperol Spritz (bought from the local supermarket and kept chilled in the ice bucket which was in our room) and look down over the beautiful city. It really was a high point (excuse the pun!) of our trip. 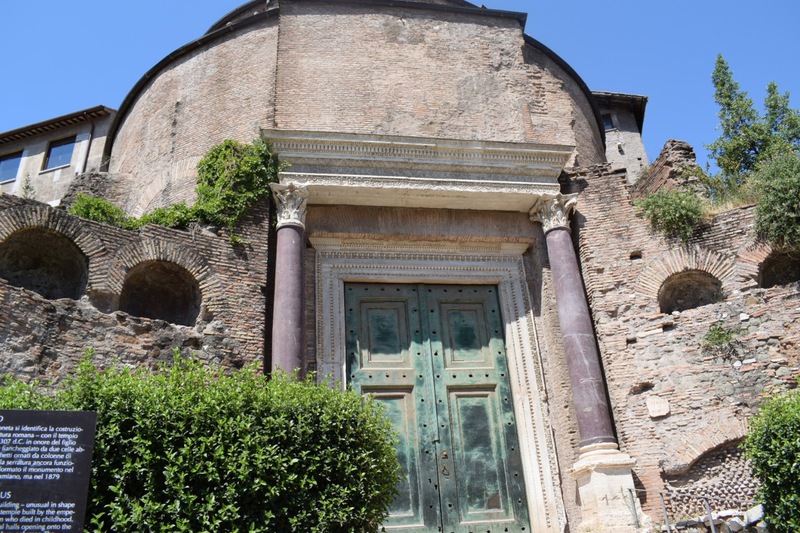 I hope you enjoyed reading about my time in Rome and it has given you some inspiration if you are planning a visit in the future. 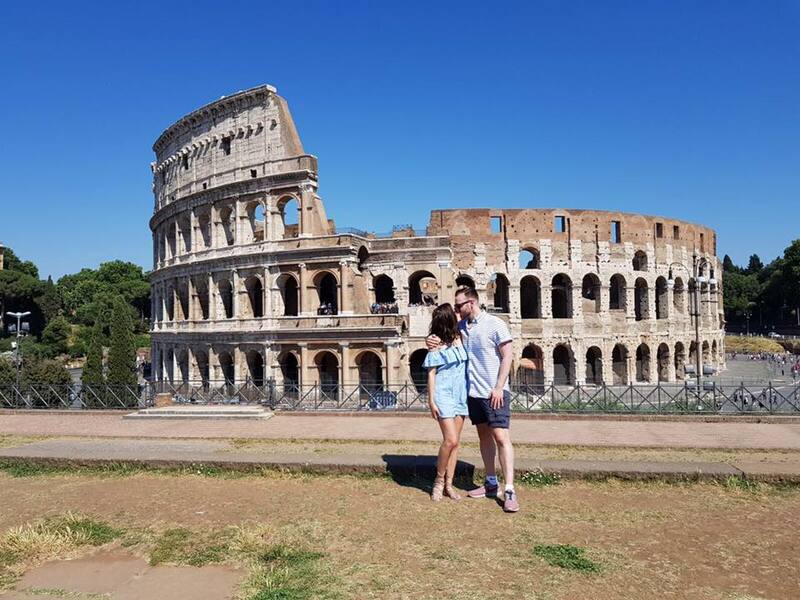 Have a watch of my Rome vlog below if you want to see some of the fun things we got up to!